A newly created medical marijuana advocacy group that includes former Attorney General Dustin McDaniel and reportedly State Medical Board Chairman Dr. Steven Cathey has waded into controversy only a day after announcing that it would serve as the “leading voice” for the state’s fledgling cannabis trade. Gov. Asa Hutchinson said Thursday he was wary of Dr. Cathey serving on the medical board while also holding a board position with the newly established Arkansas Medical Marijuana Association (AMMA) just over a month ahead of the state-imposed deadline to accept bids one of the five cultivation facilities or 32 dispensaries that will likely begin operations in early 2018. “I was not aware of this decision, and I don’t think someone on the Medical Board should be associated with a medical marijuana advocacy group,” Hutchinson said in response to a query from Talk Business & Politics. However, State Medical Board attorney Kevin O’Dwyer responded in a phone call with Talk Business & Politics that Dr. Cathey would not be a part of the new medical cannabis industry group. O’Dwyer added that he contacted Dr. Cathey concerning AMMA’s announcement earlier in the week that he was serving on the board of the new trade group, but the North Little Rock physician responded that he was not aware that he would be listed as one of the directors. “I don’t know where all that information came from, but he has never met with anybody in that organization, never attended a meeting, and obviously as a physician he is interested in how medical marijuana use is going to be implemented in Arkansas, and that is why I think they were approaching him, but he has declined any involvement,” O’Dwyer said. A person answering the phone at Dr. Cathey’s office told Talk Business & Politics he was out of town until next week. The North Little Rock physician was appointed to the State Medical Board in January 2011 by former Gov. Mike Beebe. His term as chairman expires on Dec. 31, 2022. Dr. Steven Cathey contacted Talk Business & Politics on Friday afternoon and said there was obviously some miscommunication between himself and the AMMA and State Medical Board about his potential role with the group. He said he was first approached by Couch to serve as a consultant or director in relationship to the business and corporations involved in the medical marijuana industry, but declined the offer. 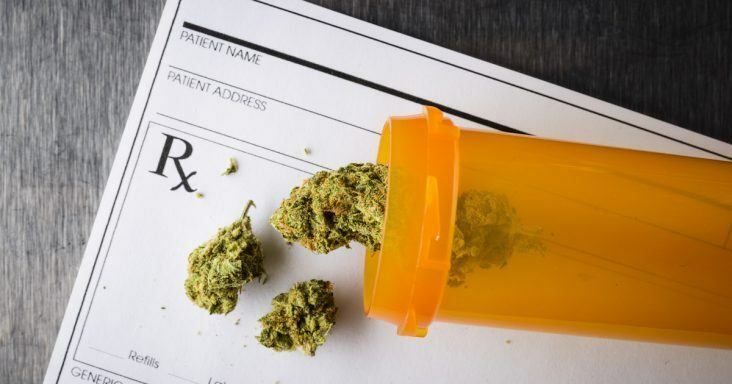 “It was my belief, and it is still my belief, that this new industry needs a clinician’s voice and input, and physicians will be heavily involved in the acquisition process for patients who are seeking medicinal marijuana cards. I think doctors need to be at the table when we consider medical and regulatory issues surrounding this new industry,” he said. Although Arkansas voters approved the constitutional amendment to legalize medical marijuana in November, Gov. Hutchinson actively campaigned against the referendum and pushed the legislature during the 2017 session to develop “a responsible implementation plan” that met the needs of patients while protecting the public and assuring public safety. The state Medical Board is charged by the General Assembly to protect the health, safety and welfare of the people of Arkansas and TO provide the highest quality healthcare. It was established by the Medical Practices Act of 1955 and Act 289 of 1957 from which the board is empowered to license and regulate the practice of medicine. In 1971, the Arkansas Osteopathic Board was abolished and the Arkansas State Medical Board assumed its licensing and regulatory duties. Since then, it has assumed the licensing regulatory responsibilities for other allied health professions, including occupational and respiratory therapists, physician assistants and radiologist assistants. The board consists of fourteen members appointed by the governor for six-year terms. Ten members, appointed upon the recommendation of the Arkansas Medical Society, are duly qualified, licensed and active medical practitioners. Two members are appointed from each of the four congressional districts and two members are appointed at large. Earlier Wednesday, Couch said part of the mission of the new trade group is to ensure state officials abide by the amendment structure as approved by voters. Arkansas voters approved of Amendment 98 in 2016 by a 53%-47% margin. The new industry trade group includes several political, legal and industry experts who will serve on the group’s board of directors. Couch, a Little Rock attorney who is on the boards of the Arkansas Advocates for Nursing Home Residents and the National Citizens Coalition for Nursing Home Reform, authored Amendment 98 to legalize medical marijuana and directed the statewide campaign to pass the constitutional amendment. McDaniel, partner at the Little Rock law firm McDaniel, Richardson and Calhoun, served two terms as Arkansas Attorney General and served a stint in the state legislature, including chair of the Joint Committee on Health Insurance and Prescription Drugs. The board also includes Pine Bluff native Stephen LaFrance, former executive vice president of Arkansas-based USA Drug. LaFrance’s namesake father, a member of the Arkansas Business Hall of Fame, founded Arkansas drug store chains that was the nation’s largest privately-owned pharmacy chain when it sold its 157 pharmacies to Walgreens in 1992 for $438 million. Other members of the AMMA board include Dan Roda, general counsel and development lead at Rock Capital Group; Kris Krane, president of Phoenix-based 4Front Ventures, a holding company with subsidiaries that have developed operating standards for retail medical marijuana dispensaries; and Dr. Richard Douglas, managing partner at PMK Associates, a Virginia-based marketing and communications firm. AMMA’s website should be operational within the next two weeks. Getting a board in place was the first step for the group, and the next effort will be to hire a full-time executive director and support staff as needed, officials said. Medical marijuana cultivators and distributors are eligible for full AMMA membership, and associate memberships are available to industry-related businesses and organizations. Now that AMMA is up and running, there is also likely to be some confusion by some consumers over the similarly named Arkansas Medical Marijuana Commission (AMMC), the independent state body created under Amendment 98 that is tasked with administering and regulating the issuance of licenses to operate medical marijuana dispensaries and cultivation facilities. That five-person board is led by Dr. Ronda Henry-Tillman, a Little Rock physician appointed by Gov. Hutchinson. The Arkansas Cannabis Industry Association (ACIA), formed by Fort Smith-based developer Storm Nolan, was the first industry formed to represented the cannabis trade in Arkansas.